Last year Susie raced to her second sixth place in Kona after 2015. She has improved her swim and bike: Her Kona bike split in 2017 was eleven minutes quicker than in 2015, an indication of the level of racing in Kona getting higher and higher. This year she finished second behind Lucy in South Africa, setting a new run PR barely missing the 3-hour mark. Her summer race at IM Austria left her frustrated as the female Pro race was overshadowed by a drafting controversy. Susie has been working hard to improve her bike leg and it’s hard to properly balance that with keeping her run strength. 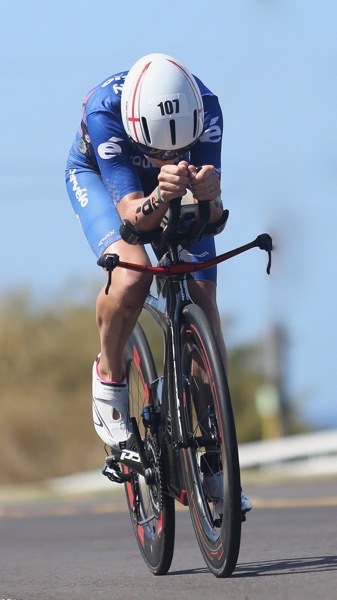 If she can manage another five-minute improvement on the bike in Kona, she could ride with a faster bike group and start the run still in touch with the podium spots. If she runs to her potential and is maybe even able to run her first sub-3, she will be in a great position to step up from her previous Kona results. Thorsten: Why have you decided not to race 70.3 Champs even though it’s in your “second home” South Africa? Susie: The timing and travel aren’t ideal for preparation for Kona. For me, the focus has to be on Kona. I know I can have a better race at Kona and that means a solid build without too much travel and the risk of illness etc that comes with traveling and racing. T: How do you view last year’s Kona result and your racing in 2018? S: I was happy to come sixth for the second time! On the other hand I would have loved to improve my position. I do think it was a better performance than 2015 for the same position but that just shows how the standard continues to progress. To be honest I think IM South Africa in April was my best Ironman to date. I was strong across all three disciplines, seconds away from breaking the 3-hour mark on a relatively tough run course. My decision to focus on a second Ironman that I didn’t need to do was probably the wrong one in hindsight but the timing has allowed me to come back and put in my best training block I’ve ever put together in the run-up to Kona. S: It’s funny, someone asked me which British women were going to Kona this year. I reeled off a couple of names but because we don’t compete as a team I wasn’t sure I’d covered everyone. The British women are really very strong, but I wouldn’t say I have an ambition to be the best Brit. If that was the case we’d all compete domestically and save the travel to Kona! For me finishing on the podium is a much stronger motivator, but in order to do so, you’ll probably have to be just about top Brit! T: What’s the goal for this year’s race in Kona? What performance do you think will be needed for a podium in Kona? S: You won’t make the podium in Kona unless you go sub-9 I would say. On the day you just give your best race, Kona is a race rather than targeting a specific time. But when you get the best women going head to head in the best shape of the year, you’re going to have to find something pretty special to make the podium. I think I’ve got that in me but it also means producing the best Ironman performance I’ve had to date. Everyone says it going into Kona, but I am training faster than I’ve ever done and I’ve had the best block of training I’ve ever done. All I can do is control what I’m capable of, I’m capable of more than I was last year but it depends where the rest of the women are which is something nobody will know until race day. T: With ten IM finishes you are already one of the more experienced athletes who are racing at the front of the race. Do you have any advice for the Kona rookies? S: It’s hot and windy! To be honest it’s the same as any Ironman in that it’s just an Ironman. What makes it tough is that you have the best women in the shape of the year on a hot and windy island. It’s when you start changing your prep (because you’re taking 16 different peoples advice) that you get into trouble! T: With your long list of low-3 marathons (3:03 South Africa 2015, 3:02 in SA 2016, 3:02 in Brasil 2017, 3:00 at SA 2017), when will you be able to finally run a sub-3 marathon? S: I know, right! If I’d known in SA .. had no idea I was so close! Start running with a better idea of what time I’m running maybe!? I’ve mixed up my run training a lot in this block. I’ve gone back to running training like I was when I was a runner. I’ve been cautious in the past because of injury but I’m more robust now than I’ve ever been. 2017 was about adapting my bike, I’ve been adjusting to that for the last year and now have got to the place that I can absorb that training and also get the run quality in (something that suffered at first when I moved to my bike coach). My run has been on a bit of a plateau because of that, but with some changes I have begun to see a shift in my running so I’m excited to see what that brings. T: What changes have you made since becoming a full-time athlete? S: I went full time mid-2015, so it seems a lifetime ago now. I suppose it’s all the little things. I have time to go and tweak my bike position, time to allow me to get away in the winter (northern hemisphere athletes will appreciate this is important!). The sleep is a big thing, when I was working I was training at 5 am, working a full day and getting on the bike at 7 or 7:30 pm which at the time I convinced myself was normal but in hindsight I have no idea how I did it!